Today I am kicking off my 3rd annual “Kids in the Kitchen” series! I have been plotting and planning for this since last summer (well actually WAY before then), and even with a solid nine (plus) months of planning, I didn’t get my act together in time to post the first recipe the first (un)official week of summer. I mean, I have been sitting on tons of these kid friendly recipes, crafts, etc. for weeks months and because of a whirlwind past few weeks (read all about my slacking ‘issues’ here) I didn’t get them up. But here I am now!! And I am ready to go! So every Friday from here until the end of August I will be serving up these ‘kid friendly’ recipes. I love sharing this series with you because I got my start in the kitchen as a young child and haven’t stopped! Today, I love sharing my love of cooking with the special kids in my life (even teaching kids cooking classes) and believe cooking with children is a great activity, especially during the long days of summer. I might add that these recipes aren’t just for kids! I will be featuring reinvented versions of the classics I grew up on, homemade versions of popular store bought snacks and other tasty bits and bites! 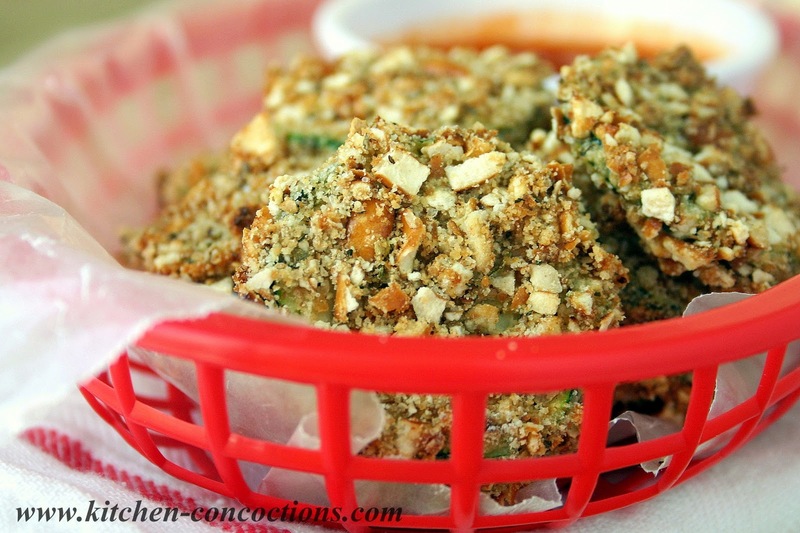 First, is a recipe I have been making for years, Crunchy Zucchini Chips. In fact, this recipe made an appearance in the early days of this blog and I thought it could totally use for some new ‘brighter’ photos and a new spot on this blog (even though the photos aren’t that great check out the blog post, I share a pretty funny story about eating zucchini as a kid!). 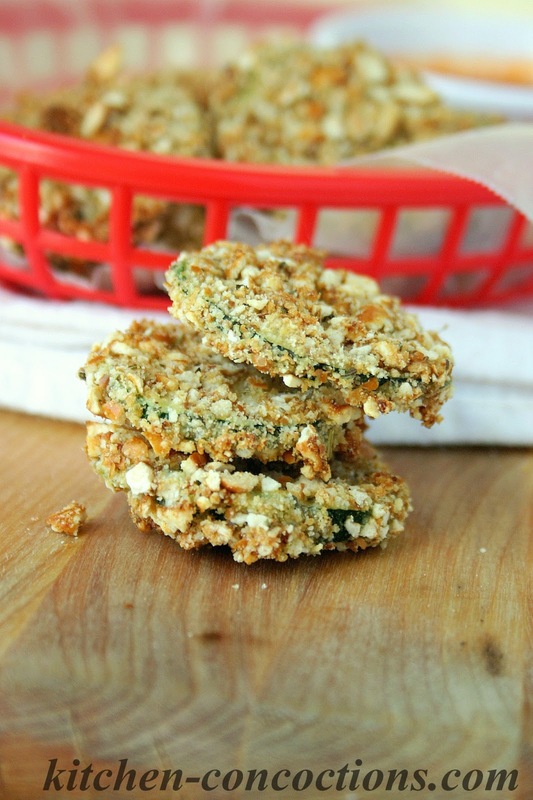 These ‘chips’ are the perfect way to get kids and adults alike to eat their green veggies! Crisp, crunchy and fun to make, these tasty little bites are perfect for snacking during family game night, as an appetizer, or a fun change to those boring side dishes! Pour crushed pretzels into a medium sized bowl. Add bread crumbs, seasonings and oil. Stir to combine. Add flour to an additional bowl and whisk eggs in a third bowl. Dip sliced zucchini first into flour and then into egg and last into seasoned pretzel mixture. Arrange prepared zucchini on baking sheet and bake at 375 degrees for 20-25 minutes or until crispy and golden brown. 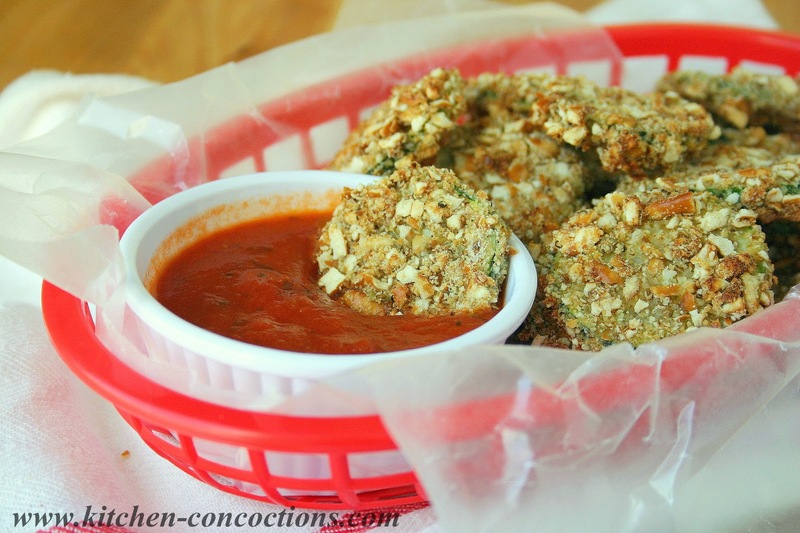 Serve with ranch dressing or marinara sauce for dipping.